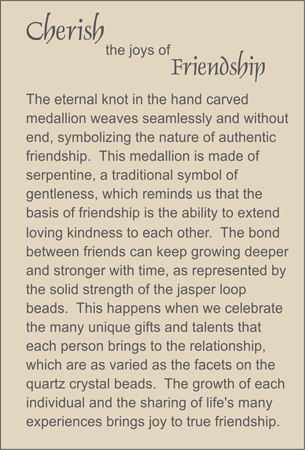 The centerpiece eternal knot bead for friendship has been hand carved from Chinese jadeite jade. This bright green-flecked ice jade has been inset into the entire choker necklace in the form of smooth beads as well as those carved with the ancient Chinese Shou for long life and prosperity Tumbled rock quartz crystal rondelles punctuate the jade. Sterling silver spring ring clasp.